In the past few weeks, both Chrome and Firefox announced that they would no longer support Flash based elements on their browsers. The decision to do so is a result of the continual discovery of Flash’s security flaws and users opting out of Flash based content. 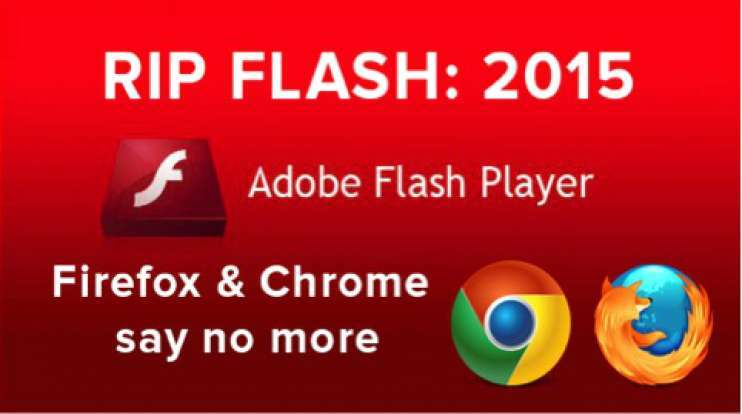 While Firefox is outright blocking Flash by default, Chrome is taking a softer approach and will not support Flash on portable (read: mobile) devices. But if the trend continues, Chrome will inevitably block Flash from desktop devices as well. Flash has been dying a long, slow pronounced death for some time now since the advent of HTML5 programming and the discovery of its security flaws. The deathblow by these two leading browsers to eliminate it entirely from their browsers is simply the final nail in its coffin. What does this mean for your online advertising? Flash has long been used as the engine to display rich media like homepage takeovers, interactive forms, expandable banners and interactive video. Users have become aware of the security flaws in Flash and long before the browsers made the decision to automatically block Flash elements, users were already conducting Google searches on how to block the media themselves. Chrome and Firefox simply made the executive decision to do this for the user, as preventing and offsetting security breaches on their browsers is in their users’ best interests. Essentially, if you’re using Flash as a cornerstone of your online marketing efforts, a large percentage of potential consumers simply won’t see your messaging. As a digital marketer, your focus will need to shift away from the whizz-bang, attention grabbing elements that Flash is known for and hone in on engaging content that actually compels the user to want to interact with your ad and messaging. You also need to make sure you’re using standardized file formats that work in HTML5, such as jpgs, gifs, MP3 file formats and .WAV files. There are more formats available but always double check what type of file is supported by the browser before outputting your final product. Rather than forcing the viewer to view your messaging by dominating their screens with Flash elements, your marketing methodology needs to steer toward a more simplified and engaging means of creative content development and eye-catching design. The format of your content also needs to be accepted across all browsers and devices—meaning the use of standard file formats of video, imagery and text that can scale across multiple platforms. And with the majority of people shopping and browsing on their mobile devices increases, your strategy needs to include a “mobile first” mentality in order to succeed. Your strategy also must focus on meaningful content marketing that can be delivered to the right audience at the right time across all channels. This requires more thought and insight into your customer’s psyche, but wouldn't you rather target an audience that’s lower in the sales funnel with content specifically directed to them rather than a broader “see-what-sticks” methodology? While as a whole the shift away from Flash based campaigns will be a painpoint for many online marketers, the net result will be more targeted, engaging and impactful advertising that speaks to the core audience you’re targeting which is ultimately what marketing is all about.